Is there any parent who has heard of Abby Sunderland who is not thinking about risk right now? I know many parents are probably thinking that Abby's parents should never have let a 16 year old embark on a journey like this--solo, around the world, in a sailboat. But I must admit that I am not one of them. If she were my child, and she had been a life-long sailor, and had done the research, gotten sponsors, and was physically up for it, I would have been her number one fan. My husband, however, would never consent to such a risky voyage. That's why God gives kids two parents. I do have a risk-taker in the house. T, my 18 year old son, has always slid down the highest banister, climbed to the top of the highest tree, driven an ATV faster than he should have (and tipped it, burning his leg on the engine block--nice scar! ), and last spring, when school was out, he took himself on a three-day solo bike ride up the Hudson River Valley without telling us where he was going or when he would be back. To get off Long Island, he biked through Manhattan and the Bronx--all new territory for the suburban boy. Oh, and he slept outside, without a tent, in the rain. Later in the summer, while participating in the Aspen Music Festival in Colorado, he regularly climbed Aspen Mountain alone, planting a flag on the peak, and recorded videos of his exploits that terrify me to this day. When he was very young and assured me that he could climb the stairs on the wrong side (by clinging to the balusters), I was convinced by a friend to consult a child expert of some sort. For $100 this expert told me that my son was not taking my warnings ("be careful!") seriously because I was not taking them seriously. I decided she was right, and I also realized that people who make their livings by making the painfully obvious clear to parents for money would surely one day rule the world. But I also realized that I was not really worried about the boy; I am simply not a worrier. 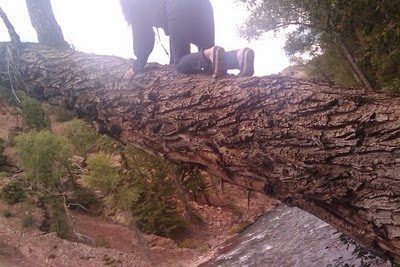 In my mind, I am also a risk taker. Mom, if you are reading, I now confess to you that I regularly cut through all the places you suggested that I avoid on my way to school in 5th and 7th grade. Yes, I took the shortcut through the city housing project, and the one through the park before it was daylight. And I very badly wanted to take off on my own adventure to anywhere, live off the land and possibly become ruler of my own island. So if my children actually hit the road and do the things I only dreamed of, how can I tell them "no"? And as if my own adventuresome tendency were not enough, I have made sure to feed the kids a steady diet of adventure novels, from Arthur Ransome's real-life sailing novels, to Tolkien's adventures in Middle Earth, to Heinlein's juvenile novels (careful to stick with the titles for teens) of off-world technology and politics. Can a child raised on Kipling or Twain be long kept from real-life adventure? I read Erin Manning's take on this with some interest. Like so many of us, she recalls the tragic death of 7 year old Jessica Dubroff who tried to be the youngest to fly across the US. But I think there is a huge difference between a 7 year old and a 16 year old. A 7 year old, just reaching the "age of reason" still requires parents to make solid decisions without, frankly, discussing the matter with her in any great detail. The parents of a 7 year old can be faulted for saying that flying a plane is her greatest wish, or that she died joyfully doing what she wanted most to do. Rather, I imagine she died in either terror or ignorance, not in a blaze of happy glory. I had my young children follow Jessica's story, but promptly turned the TV off when she died. It was just too horrible. Abby's story is quite different, and fortunately, has a rather better ending. Abby is a life-long sailor. As a sailing enthusiast myself, I know that feeling of being on the water, alone. I learned to sail at 13, my brother at 11, and my cousin at 10, all during the same summer at Boston's Community Boating facility. Sailing is a skill that a 10 year old can easily acquire ("...if not duffers, won't drown..."), and it is common to find accomplished teen sailors with many hours of varied experiences--calm seas and rough seas, with equipment failures and leaks, gales and doldums--and strong survival skills. And, yes, when a 16 year old has the urge to sail around the world solo, that urge is more likely to be a legitimate personal goal than any dream of a 7 year old. Therein lies the difference between these two stories. T, no doubt as a result of years of adventure stories, thought Abby's whole plan was a cheat and a fraud. 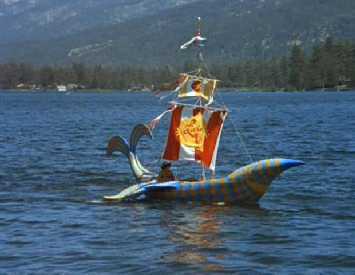 He referred to Wild Eyes as a "robot ship" (which made me think of the boat from H. R. Pufnstuf) and rolled his eyes when she had problems with her auto-pilot. When he discovered that she was blogging and on Facebook, he howled. To him, this seemed like a false adventure, an adventure with too many precautions was not worthy of being called "adventure" at all. The irony is that T will be heading to the Webb Institute for college (one wag called it "MIT meets Lord of the Flies," but I like to think of it as Real Genius meets Swallows and Amazons), learning the art and engineering required for designing and building pleasure yachts, container ships, cruise ships, military vessels, "robot ships" and more. He will be interning, possibly on a container ship, most likely in the Pacific, during the winter. There will be serious rules that must be obeyed for the safety of all on board. Safety is one of those little details that ship designers must consider during their work...how will T respond? As a parent, I hope he stays safe, and manages to obey the rules. But as a parent, I also know that sometimes teens have to strike out on their own and learn for themselves that our warnings and suggestions are not just a matter of us trying to ruin their fun. You and I really are kindred spirits. My first reaction to Abby's story was one of shock and then I thought it through more fully. For me it would depend on my knowledge of my child. At 16, my Hope (now 18) was an adult in every way except chronological age. It is actually a relief that she is now 18, because I will not be second guessed for treating her as such. So back to Abby, as long as safety protocols were put in place along with a solid plan (which like you said, they were), who am I to second guess her parents. Thank God she is safe. We live in a society that infantalizes (don't know if that's a word?) those in their teens and twenties. I'd rather see a 16 year old treated as an adult than a 25 year old who is still treated like a child!!! Had the same thoughts as you, MacBeth, as I read through Abby S's story. As the mom of two scouts and wife of scoutmaster, I am learning every day to live with more and more risk, increasing a little each time. My dh is the one who decides what level of risk is okay for the boys and I trust his judgment. I'd always had a sense of adventure though failed to follow up on it many times, but from time to time I still imagine what it would be like to skydive. I tell my kids I'd do it if I didn't have a family of my own. As for Abby, I see it as a calculated risk -- they knew the dangers and they prepared well for it. And my hat's off to Abby -- the first phrase that came to mind was "Do Hard Things" (Brett and Alex Harris). It's a challenge our young people need to hear more of these days, as so many of them seem to be falling through the cracks of mediocrity. I'm with you MacBeth; but my husband is with your husband. Like you said, it's why we have two parents. I'm very laissez faire and he's much more concerned about all sorts of risk. i agree too because if you think about it, black people tend to take more risks when they rob banks and shoot people because they risk their lives without thinking of the consequences.